« Fadupinator.com – first post! Night-time in New Texas : Zombies abound! Some of you might know a bit about the Super Energy Apocalypse story. If not, you can read about it here at Jay Is Games. My boss, Robert Harriss of the Houston Advanced Research Center, was really happy with SEA and has decided to keep me on for at least one more of these projects. If HARC rides out the economic crisis, I might even have a full-time job. So, Bob (as he insists on being called 🙂 ), has been talking to me about what our next project will be. This is the first in a series of posts on that train of thought. First, I assessed how things went with both versions of Super Energy Apocalypse. That’s what we’ll talk about today. People liked it! Feedback said it was a lot of fun. The “attacking zombies” mechanic seemed to work out pretty well, I received a lot of positive feedback about this from not only players but other game designers. Although it has nothing to do with educational material, it serves as a good motivation to learn the core mechanics of the game, which have a lot to do with the game’s message. The baked-in tutorial seemed to work effectively in getting players ramped up on all the game’s features. People seemed to enjoy the story, and I even got a few comments along the lines of “OMG b3st story 3VAR in a Fl4SH game!! !111!” Which were cool, but probably just because standards tend to be low in the flash games market because of all the amateur games. When you start competing with the big boys (ArmorGames, CasualCollective, etc), though there’s a whole ‘nother level to live up to. We had DRASTICALLY fewer bugs on SEA:Recycled than on the original. 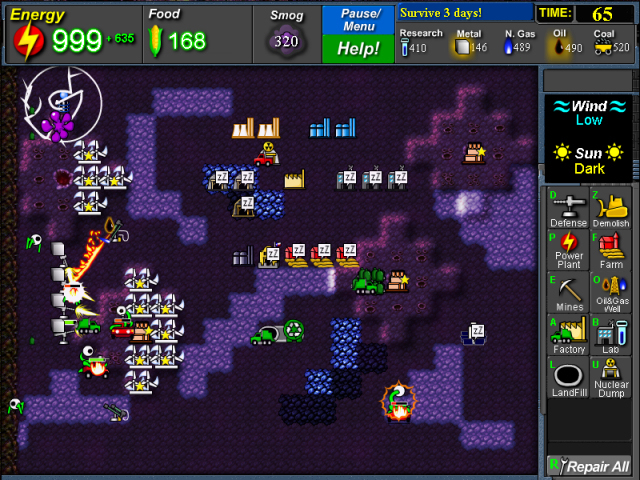 Sandbox mode was a huge success, and essential for the game. People loved playing around with this. Got some great feedback on the Theme Song 🙂 We’ll have our first batch of MP3 sales data in March to see if putting it up on TuneCore has helped us out financially. We had mixed results on people grasping the greater nuances of energy economy. The game was supposed to model the “flow” of energy transformations. Ie, players would switch to electric cars while running coal plants, build more coal plants to meet the new energy demand, note that smog was going UP after the switch, and learn a lesson about managing an entire system’s pollutant output (the whole economy) rather than just one sector (transportation). Some people grasped this, but a lot of people didn’t make these connections. Players absolutely BLAZED through campaign mode, usually in one sitting, and the game lost replay value after that. Also, there was little incentive to play it on harder difficulty modes since the story(the main payoff) was exactly the same. The baked-in tutorial annoyed a lot of people, even though it was useful for getting new players up to speed. The fact that it integrated into the story and basic level progression, as well being part of your cumulative socre, made it fundamentally un-skippable, which was irritating to repeat players. Only about half of the in-game sound events were volume-adjustable because of the slap-dash way sound was implemented, . This annoyed people. Kongregate fans rose up with one voice demanding a “Mute” button. I had no idea this feature was suppoosed to be standard but now I do. Badges based on my statistics never worked right on Kongregate. Not sure if this was my fault or Kong’s, but it’s something that people complained about so it’s noted here. We really needed a whole “challenge mode” with at least 25 different scenarios, for real replay value. People blazed through the 5 included “challenges” fairly quickly. Again, needed more replay value. The whole “upgrade” system really distorted what was going on. People would upgrade a nuclear plant to level 3 and then compare it’s statistics to a level 1 geothermal plant and try to draw conclusions based on that. Ambiguity in my presentation of numbers. No single power plant used in the game really represents a typical real-world facility. What I did instead was use real-world data to calculate ratios of numbers for each plant (Cost to build : Output : Emissions : Etc). I then would multiply all the numbers in the ratio by a constant value to get the results you see in-game. This means that whereas our “Coal Plant” in game might represent, say (not real data, just making stuff up for example’s sake) 2 “typical” Coal Plants, a “Solar Plant” might represent something like 100 of those facilities, and the cost, output, and emissions would reflect that. I really need to come up with a way that takes land use into account so that players can more easily compare different power sources. The game needed more research numbers and data presented as such. I got too zealous in trying teach purely through mechanics. I think the players wanted a little prompting with a little mini-encyclopedia with info about each facility, power, and fuel source. All in all, not bad for my first “professional” game projet. The project was a success, and we succeeded in getting our most basic message across : Energy doesn’t come from nowhere, it comes from power plants, and you can’t begin to talk about energy economy (especially transportation and fuel economy) without talking the rest of the system into account. There’s a difference between truly “reducing” emissions and just moving them around. Ethanol fuel increases emissions through increased farm use, and electric cars only make sense if your power grid is also low-emissions. (Electric cars running off a coal-powered power grid are really coal powered cars). This entry was posted on March 2, 2009 at 9:35 pm	and is filed under Brain Juice. Tagged: Energy, Environment, Flash, Games, postmortems, SEA, Sustainability, Zombies. You can follow any responses to this entry through the RSS 2.0 feed. You can leave a response, or trackback from your own site.